Bloggers and thrifters, can you help me? 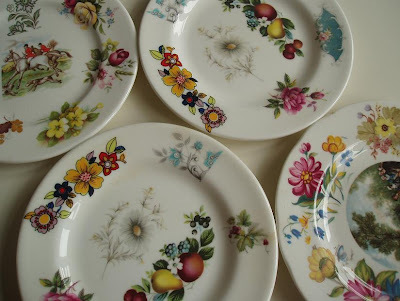 I have just thrifted these four plates, purely on the basis that they are so unusual (and that they were only £1 for the lot!). Although they are not my usual style, I am kind of drawn to them for their over-the-top madness, but will probably end up re-selling them due to lack of space in my kitchen cupboards. My question to you is - what's going on with the mad multi-transfer thing? My best guess is that they were factory samples. There is nothing on the back other than hand-painted numbers, so unless someone recognises one of the transfers I have no way of knowing which factory they came from. I'm finding it impossible to Google them as I don't know what they would be called. And equally importantly - Nice or nasty? Would you have bought them? Do you think anyone else will buy them? All comments and wild guesses gratefully received. I don't recognise any of the patterns I'm afraid. 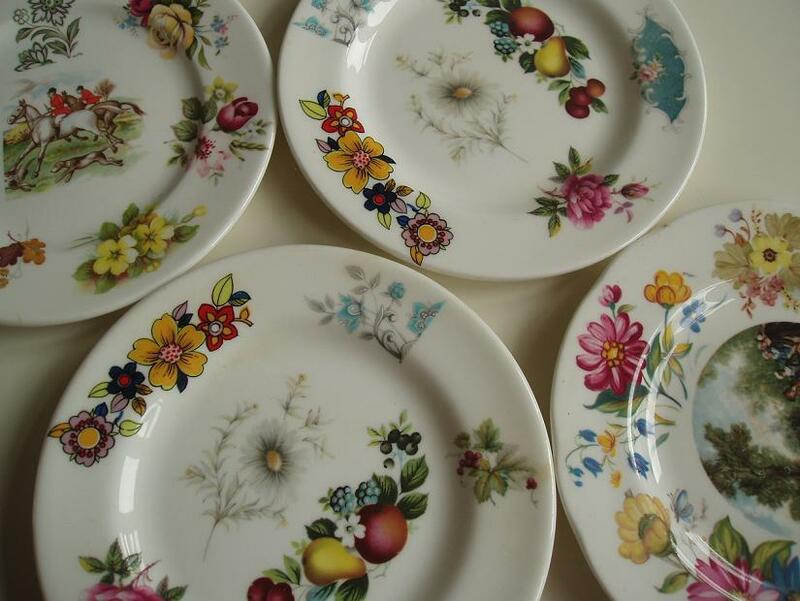 They are certainly unusual - a pattern to please every taste! Gosh, they are a real mishmash arent' they? 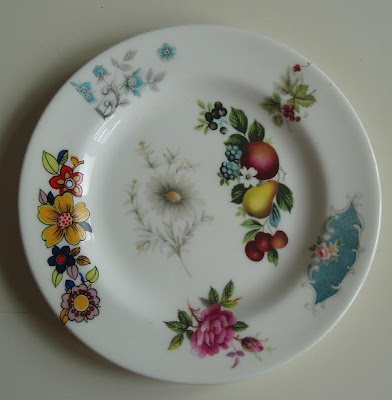 I like them though, but probably wouldn't have bought them as I'm having to operate a strict "one-in-one-out" policy on plates at the moment! How unusual and I would guess that they are salesman's samples. The salesman would travel around with either miniature versions of dinner & tea services or these multi transferred ones to save carrying round the larger versions especially on the rickety old roads of old. They are firing samples! When a new batch of transfers arrive on the shop floor they would be applied to a set of plates and placed at various positions in the kiln. This would ensure that the transfers matched the company standard and that the colours were stable at slightly different temperatures. It would be hard to tell which company. If you can scan one (and yes it should be possible) or take a good, high res photo you might try cropping out one particular part and doing the new google image search. My guess would be Spode. Thanks, all of you - I love blogging, it's brilliant to have access to so many opinions and so much knowledge. Special thanks to Mrs Tightwad for giving me the correct terminology. I'm going to play with the new Google Image search later and will let you know if I have any success. More comments still welcome, especially on the "nice" or "nasty" vote! I think knowing they are little samplers makes them really special, a little piece of each design printed beautifully. I think they are quirky and and would find it hard to part with them.